Winter Break will start at 5 pm, Friday, December 7, 2018 with the closure of the Residential Complex – Note: Valsetz Dining Hall will close at 4 pm. Winter Break officially ends at NOON on Sunday, January 6, 2019. With the exception of residents of Alderview, Family and Graduate Housing and Arbor Park, if you choose to stay on campus during any or all of this break, your student account will be charged $250. University Housing and Campus Dining will open their doors at Noon, on January 6th to welcome returning residents as well as incoming students arriving for the beginning of Winter Term. Classes start Monday, January 7, 2019. If you have a vacancy in your room or apartment, TO AVOID SINGLE/HIGHER ROOM CHARGES – make sure that the space is “Roommate Ready”. ” A new roommate should have a clean space free of belongings and decor. Furniture needs to be arranged for practical use for a new roommate (e.g. un-bunk beds – no other furniture combined in any way). Floors should be clear and clean. One half the room needs to be completely clear of your belongings. Remove all trash from the room”. ALL ROOMS WILL BE INSPECTED FOR COMPLIANCE. Residential violations will be documented and you will be charged accordingly. 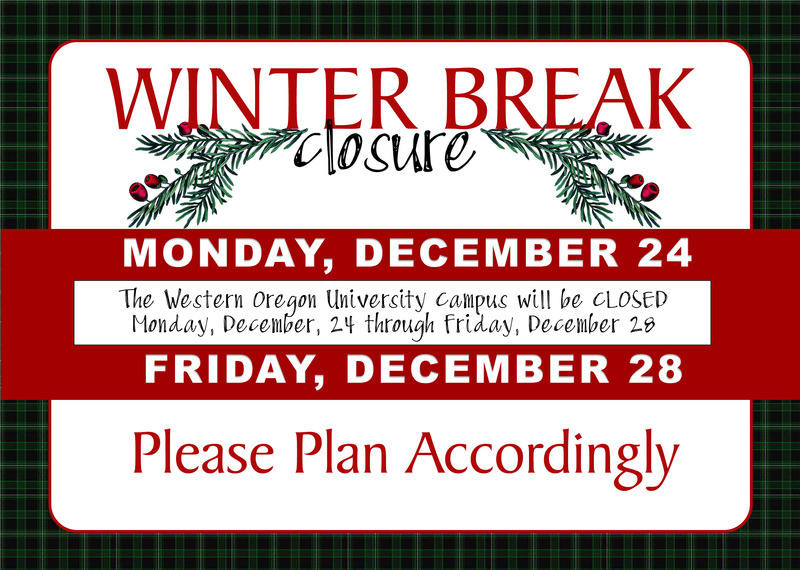 if you find during the break that you will not be returning to WOU and living on-campus for Winter Term. CAMPUS CLOSURE – The WOU Campus and University Housing WILL BE CLOSED DECEMBER 24-30, 2018. No business of any kind will take place during this closure. leave your room in order and avoid paying extra fees. 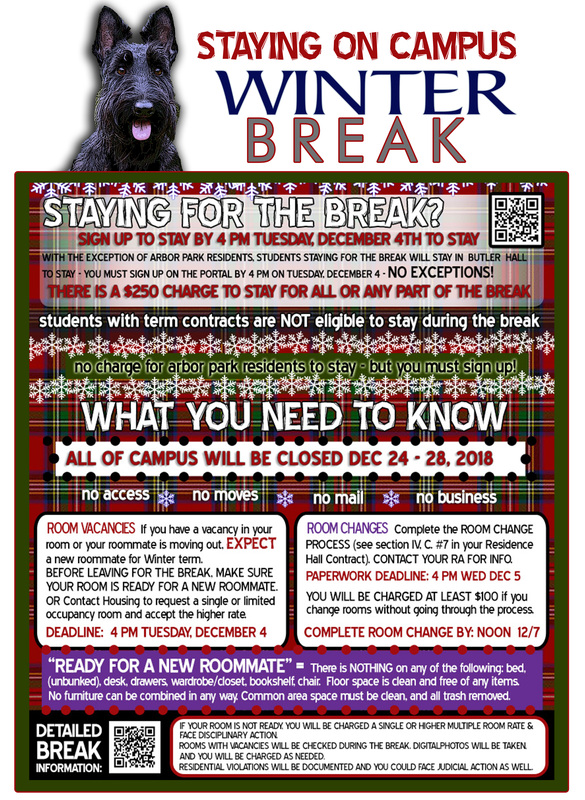 WINTER BREAK TIMELINE AND CHECKLIST TO MAKE SURE YOUR ROOM IS READY FOR THE BREAK! The RSC will be open limited hours for mail and packages during the break – excluding campus closure (DEC 24-28). DON’T FORGET YOUR STUFF! Wherever you go for the break – Don’t forget to take what you need with you! NO ACCESS TO ROOMS (with the exception of Arbor Park) UNTIL NOON SUNDAY, JAN 6, 2019! DEADLINE: 4:00 pm on TUESDAY, DECEMBER 4, 2018. (Room rates for Arbor Park include the break so there is no further charge for you to stay during the break). Valsetz Dining Hall closes at 4:00 pm, Friday, December 7, 2018 – THERE WILL BE NO FOOD SERVICE UNTIL NOON, SUNDAY, JANUARY 6, 2019. See below for options for food during this time period. Caffe Allegro and the Convenience store will be open in the Werner University Center. See Campus Dining for specific hours of operation during the break. Allegro and the “C” store will be closed during the campus closure dates: December 24-28, 2018. YOU MUST LOG ONTO THE PORTAL AND SIGN UP TO STAY BY 4:00 PM, TUESDAY DECEMBER 4th TO STAY!! – NO EXCEPTIONS! Make sure that you BOTH sign up to stay for the break and that you BOTH list one another as roommate choices for the break when you sign up! Please take everything that you will need during the break – YOU WILL NOT HAVE ACCESS TO YOUR REGULAR ROOM UNTIL AFTER NOON on SUNDAY, JANUARY 6th, when you may turn in your Winter Break keys to the RSC and move back into your academic room. 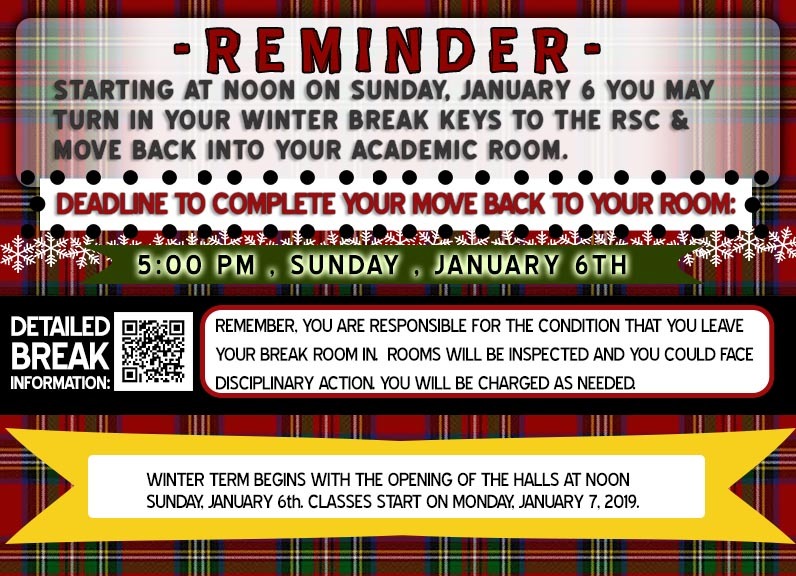 You must complete your move back to your academic room and return your Winter Break fob by 5:00 pm, Sunday, January 6th. YOUR ACCOUNT WILL BE CHARGED $250 FOR STAYING FOR ANY OR ALL OF THE BREAK. TRANSITION DETAILS to move back to your Academic Rooms from your Butler Hall Room. REMEMBER: DEADLINE TO SIGN UP TO STAY: 4:00 pm, Tuesday, December 4th. Click on “WOU University Housing” to access your Housing Overview. menu under Apps and Forms at the top of the page & sign up to stay! 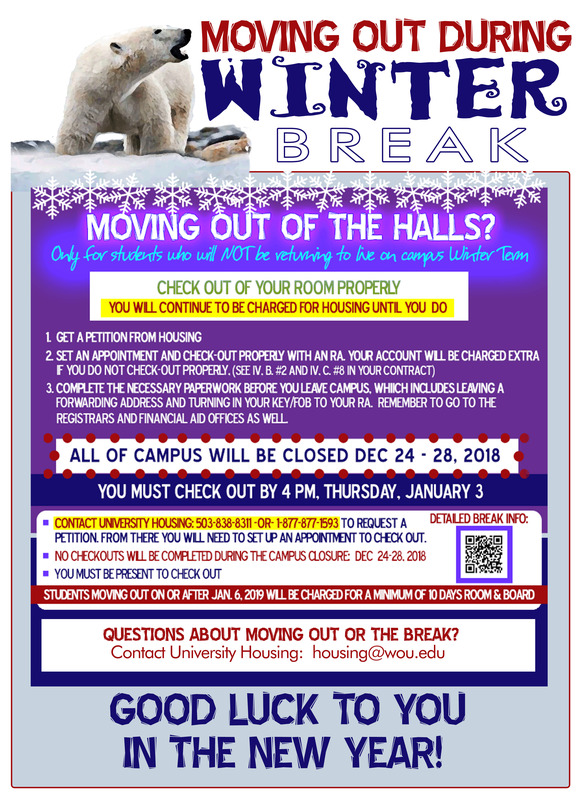 Please use the link below to access emergency contact information as well as general information regarding Winter Break and its impact upon you as a resident. As a reminder of potential COLD WEATHER – Please use the following Cold Weather Tips to keep your apartments warm, hassle-free and in good shape in the event of cold weather during the break. Leave Cupboard doors under sinks open. This allows warm air to circulate in and around the pipes. In severe cold weather, open the faucets (both hot and cold, sinks and tubs) JUST slightly and let the water drip all the time. (For obvious reasons, make sure that the drain is not plugged). This simple precaution can prevent most major pipe damage. they get to you is appreciated! If cold weather occurs during the break, and you are not at home, campus personnel may enter your apartments to check and open faucets. Wherever you spend your break, University Housing and Campus Dining wish you a safe and shining Winter Break!